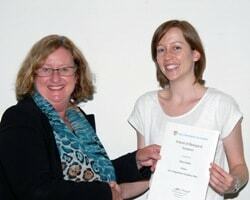 The Postgraduate Excellence Prize was announced this month with Alex Carthey, of the Behavioural Ecology and Conservation Research Group, taking the top prize for her work entitled 'The smellier side of naiveté: adventures in chemistry'. 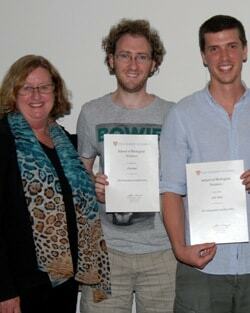 The other finalists were Joshua Amiel, Martyna Molak and Chris Reid. "It was really hard to separate them all," said one of the judges, Associate Professor Peter Banks, "all applicants were very impressive and high achievers. It makes the judging job really hard but tremendous for the School of Biological Sciences to have such a talented pool of PhD students." Alex's PhD research is looking at naiveté in native small mammals, like bandicoots and bush rats, when confronted by alien predators such as dogs, cats and foxes. As these small native mammals have not co-evolved with the alien predators, will they recognize them as a danger? The answer is 'somewhat', according to Alex. "I've found that native prey are not in fact completely naive towards the risk posed by these unfamiliar predators," she explained. "In many cases they seem to recognise them and show increased vigilance or other antipredator behaviours." Prey behaviour was investigated by observing the native mammals responses to dog, fox and cat odours. "Most mammalian prey recognise their predators using odour cues, so this was an important part of understanding naiveté towards alien predators," Alex said. "In Australia, all our alien predators are placental mammals whilst our native predators are almost all marsupial." Predator body odour, collected from animal bedding, was used to provoke prey responses. By looking at the chemical composition of their poo, urine and body odour - pew! - Alex aimed to determine if native (marsupial) and alien (placental) predators smelt the same. "The chemical analysis showed that marsupial and placental mammals smell different," said Alex. "This difference in smell probably explains why native prey may fail to recognise alien placental predator odours and defend themselves properly." The fact that Alex found that native prey were not completely naïve can probably be put down to the similarity in odour chemical composition between dingoes and dogs - dingoes being a predator with which bandicoots and bush rats have more experience. "I was really blown away when it was announced that I'd won," exclaimed Alex. "The prize will be going towards my post-thesis submission holiday to Costa Rica, which is certainly keeping me motivated!" The Postgraduate Excellence Prize is judged on an initial application, followed by a presentation from four short-listed finalists. The presentations from this year's finalists covered reptile learning, ancient DNA analysis and slime mould spatial memory, as well as dog B.O. Joshua Amiel presented a talk entitled 'The effects of incubation temperature on reptile learning behaviour'. He found that a hotter incubation temperature resulted in smarter lizards. Martyna Molak spoke about the complexities of using ancient DNA and the limit of its usefulness to a few million years, due to the accumulation of damage. Distressingly, she shattered all our hopes for a Jurassic Park-type dinosaur resurrection in the future. Chris Reid presented his finding about the externalised spatial memory displayed by slime mould. He found that slime mould used its slime as a way to avoid foraging in areas it had already explored. Thanks must go to the Postgraduate Excellence Prize judging panel, which consisted of Peter Banks, Deborah Barton, Neville Firth and Stephen Kwong, as well as to Ella Brear for organising and chairing the final seminars. Good luck to our students for next year's prize.